We had a tasty discussion of its origins in the first and second installments of this series. And we came to the conclusion that apparently every people will butter their own bread. And also claim to have invented barbecue. Considering that I’m a gaucho, it’s about time I ‘pulled the ember’ to my side and discussed the history around South Brazilian churrasco. This will be the subject of this final article on the origins of barbecue. In the 18th century, slave traders destroyed the Jesuit Reductions. When they expelled the Jesuits, they left behind their herds. This spread over the pampas and multiplied, thus producing an offspring of “wild” cattle. 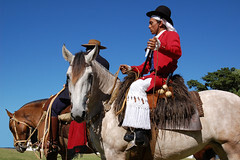 In time, large ranches (called estâncias) established and gaucho cowboys hunted down and herded such “wild” livestock. Those peons spent weeks, sometimes months, deep in the pampas, performing their duties with only their horse as a companion. It’s not difficult to see, then, how beef became a staple of the gaucho, as it was their main food source on the pampas. Initially, they used ashes to “season” the meat. Later, the gaucho peons followed a practice they learned from the natives of placing fresh meat under their saddles. so that it got “salted” the horse’s sweat. (No comments!) In time, they came to use the same coarse salt given to the cattle as a food supply for seasoning the meat. Learning about the origins of barbecue may be fascinating, but if you think that the best thing to do about churrasco is eat it, I’ll definitely agree with you. So go ahead and savor this delicious dish of very humble origin!